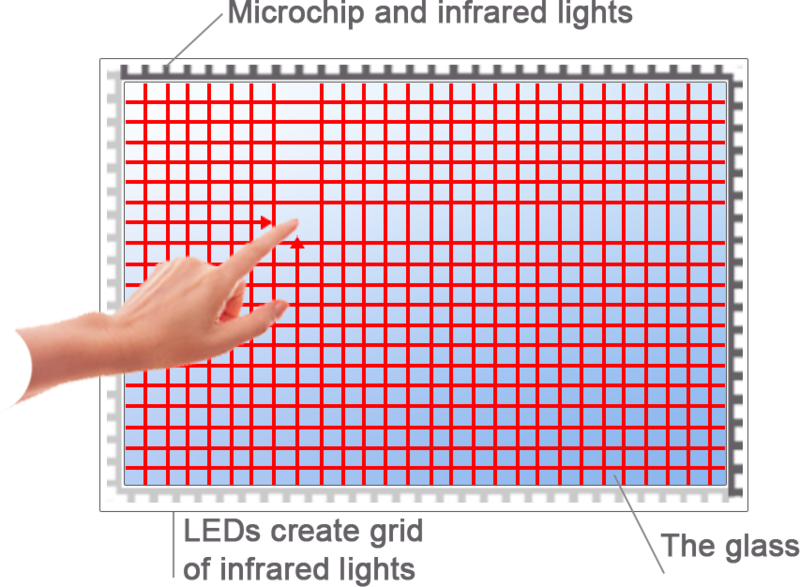 One of the advantages of infrared screens is their size range. It’s possible to produce small size screens of 10” and the frames of nearly unlimited sizes. Infrared touch screens can be made as a frame with glass of up to 42” and as a frame without glass of up to 300”. Infrared screens are used wherever high-definition and colorful images are required. They are suitable for presentations, commercials & demonstration materials and digital signage. Touch screens of infrared technology are often used in educational institutions - schools, universities, colleges. The screen with 2-touch support enables scaling, zooming and image rotating. If the multi-touch device recognizes more than two touch points, you can use gesture control instead of keyboard shortcuts. It can be used in any season of the year and in different climates. At low / high operating temperatures it is necessary to think about the heating / cooling of the equipment where the touch screen is built-in. Can be used by a great number of users daily.